~5 month supply. 0.78 oz. 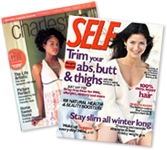 RETEXTURIZE AND REJUVENATE YOUR SKIN! A secret to anti-aging is deep exfoliation! Natural medical-grade mineral crystals, used in doctor’s offices, immediately retexturize and rejuvenate your skin… to a fresh, healthy, younger-looking radiance… AT HOME. Dermatologist recommended. Dramatically resurfaces skin for a flawless look. Aluminum Oxide crystals and a Vitamin C base help repair sun damaged skin and reduce the effects of aging. Providing an alternative to microdermabrasion without irritation and down time. FOR COMBINATION / NORMAL / DRY SKIN: Apply a small amount of product to face 1-2 times a week. Scrub in a circular motion for two minutes. Thoroughly rinse and follow with VITAPURE Serum. FOR ROSACEA-LIKE SKIN: Use only once a week. Apply no pressure to rosacea-like areas. Rinse thoroughly and apply VITAPURE Serum. 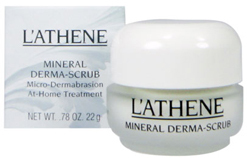 Skin Deep Magazine spotlighted L’ATHENE MINERAL DERMA-SCRUB as the ULTIMATE EXFOLIATOR. MINERAL DERMA-SCRUB is a unique deep exfoliation. 40 concentrated treatments per jar ($1.70 per treatment). Concentrated means 99+% pure ingredients—not a lot of water and fillers (standard cosmetic chemicals). Does not scratch or pull the epidermis; they maintain their shape and don't deteriorate during treatments. Other crystals and organic compounds, such as walnuts and almond shells, have an irregular shape and can deteriorate; therefore more product needs to be used during treatments. Deep Exfoliation is important with aging. As we age, our skin cells don’t regenerate as quickly. Dead skin cells accumulate on the surface and our complexions look dull. By effectively exfoliating off those skin cells, new cells surface. With MINERAL DERMA-SCRUB, you can help to move those dead cells off the surface and reveal a more radiant complexion. Skin will feel softer, smoother and younger-looking. Will see a brightness and slight pink color to the skin—this is normal and is the fresh, healthy new skin cells. Always apply a good sunscreen if going outside after the treatment. For treating old acne scars, do several applications and gradually the skin will become smoother. This product contains the same crystals as a professional office treatment. This product contains the same ingredients, and though not as aggressive as a professional office treatment, it delivers significant improvement to the skin's surface and you see noticeable results.